Text that follows the rim or spokes of a wheel is sometimes upside-down, making it hard to read. The two subnetworks in this demo, true_arc and true_spoke, solve this problem, creating text that is always right-side-up and easy to read regardless of where it lands. True_arc is for text placed on the rim of a wheel. Given the position and radius of your wheel, and the angle where you want the text to start, it creates an arc path that causes text to flow clockwise when it lands above the horizon, or counter-clockwise when it lands below the horizon. 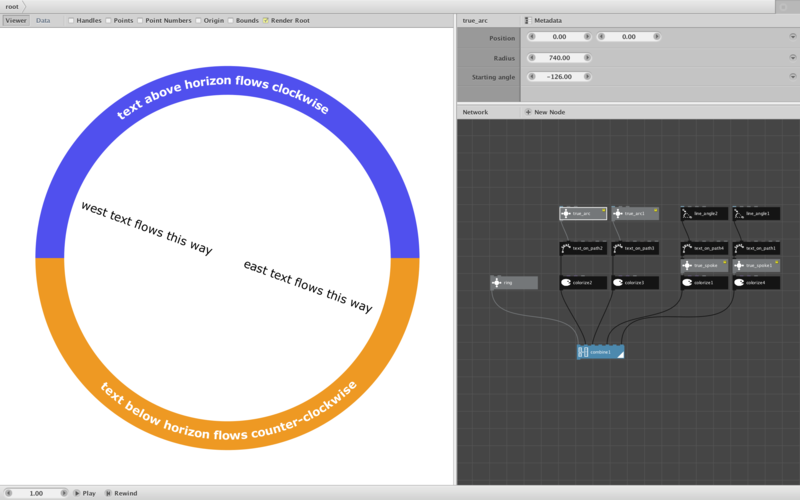 Just feed it into your text on path node. True_spoke is for text placed on the spokes of the wheel. 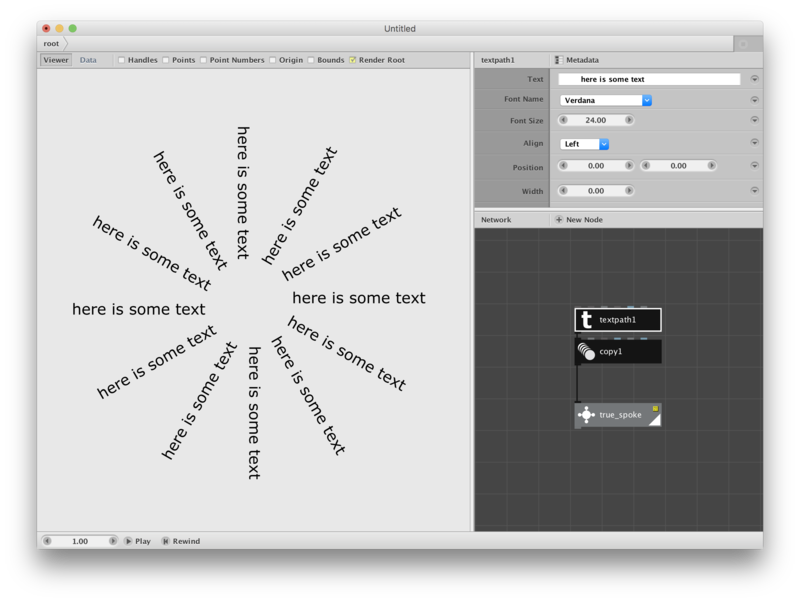 Create your text first using a text on path node and then feed that into true_spoke. If the text is flowing in an easterly direction it leaves it alone; if it is flowing in a westerly direction it rotates the text so that it will read correctly. NOTE: True_spoke tries to guess the direction of the text path by looking at the first and last points, which will vary slightly depending on the font and how each character is drawn. When the angle is close to due north or due south the direction can flip back and forth in subsequent spokes if spokes are close together. If this happens, replace true_spoke with the flip_spoke subnetwork (inside true_spoke). Flip_spoke requires the angle, so you will have to provide that yourself. The attached demo shows both cases with two instances of text on the rim and two instances of text on the spokes. Thanks John! I'm just researching on the solution of rotating text and this seems to be very close to what I need. I have one question though, if I use multiple rotated "textpath" instead of using "text on path" can it still work? Thank you! Yes, it works fine with ordinary text paths as well. See attached screenshot and three-node demo. I hope this node helps you with your project! It certainly did. Saved so much time. Really appreciate it John.